Surat-based Design Work Group likes to keep its designs approachable, low on frills, and reflective of their clients’ most sensitive demands. The Design Work Group (DWG) team always works with a sharp-eyed focus on its agreed-upon scheme. The firm deals in ideas, which means it is unafraid of mixing the old with the new, not feeling the need to sacrifice one for the other. Founded in 2006, the team states that, “We pride ourselves in our diligence and our humility.” These facets are indeed hard to miss in their projects, like the ones mentioned in this piece. The team always manages to mix the traditional and the modern brilliantly, while never losing the human side of the scheme. This project stays true to its name. 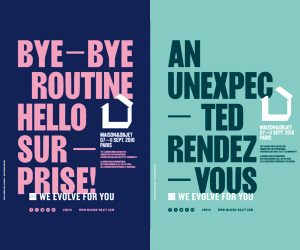 Three Cs inspired the look here – climate, context, and client’s brief. 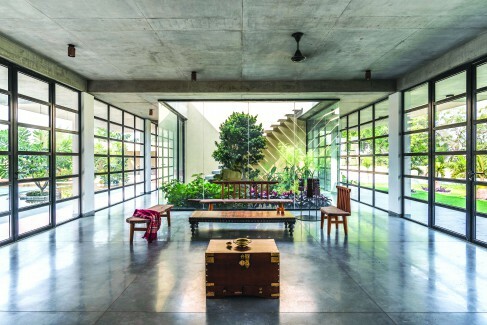 In the humid climes of Surat, this home had to be a cooling refuge. For this, the team establishes a familiar layout – a private section away from the bustle of the streets, public zones facing outwards, and both connected by a strip that harks back to the courtyard template. 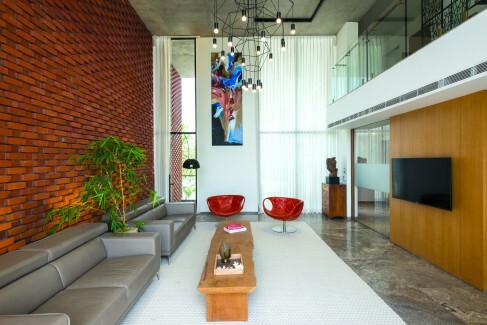 A double-height living room zone, bookended by semi-open sections, facilitates the client’s sociability. The home office is a level higher, its placidity fed by surrounding terrace gardens. This whole set-up stands like a sentinel protecting the sanctity of the sections built behind. 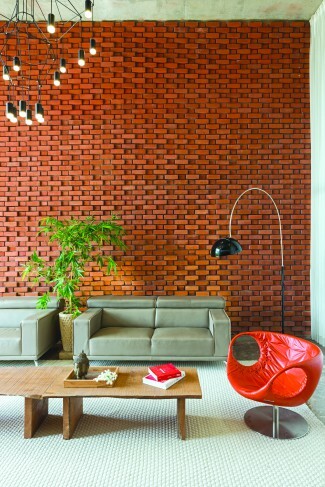 The brick curtain comes into play as a vital element that cuts the heat gain in this section. Consisting of 83 reinforced layers, the curtain is not an even spread – the bookends are conventional and straight, while the central patch is undulating, consisting of three tall patches of bulges. 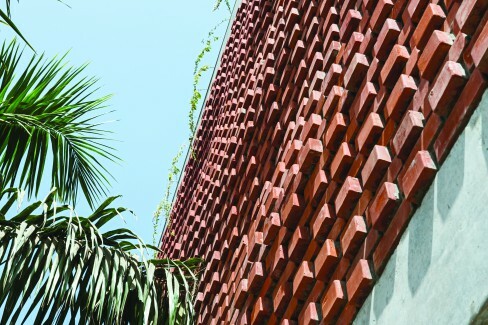 A fascinating display of ‘movement’ is allowed on the facade, while also cleverly assigns the home a recognisable skin that doesn’t jar in the neighbourhood. 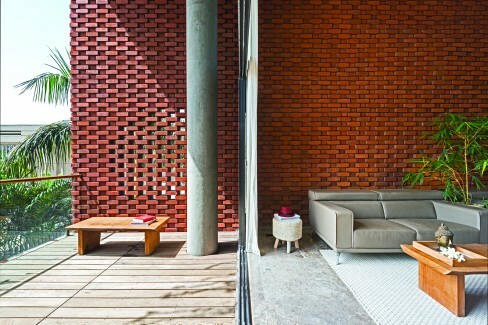 The team talks about how the brick curtain adds “simplicity and integrity” to the interiors, and one can’t but agree – a playful dance of light and shade permeates the sun-facing sections, making them look warm and welcoming with little effort. The lower segment at the back, standing juxtaposed with the parking section facing outwards, consists of the servant quarters and a multi-purpose hall, looking out to a garden. Above are the kitchen and dining areas, and the bedrooms. The central connecting zone features the prayer room, placed in a way that all upper levels can be afforded a view of it. These small, sensitive elements make the DWG design approach special. One look at this house and you know it wasn’t built to give the residents a feel of city-life. 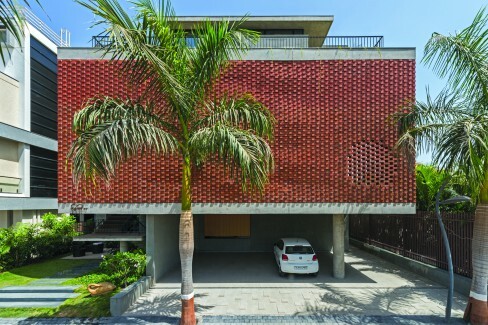 Located in Vav village in Surat, the home’s name and structure allude to a quieter living that is closer to nature, facets that are established right at the entrance. The home is a hearty amalgamation of large uncluttered spaces and swathes of beautifully landscaped greenery. 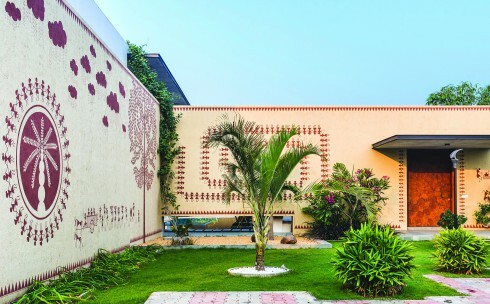 In the midst of it all is the eye-catching art work on the walls – simple, rustic patches of Warli paintings that instantly conjure up the pleasures of bucolic living. In its girth, this is by no means a humble home and spread across a total area of 710 sq m, the residence is divided into two blocks by a central zone inspired by the traditional courtyard-style layout. The single-storied northern block is airy and open, with an internal courtyard playing host to the living and dining areas and providing great views of the outer and inner landscapes. “The large openings are shaded using overhangs and awnings that form the semi covered ottlas on both sides,” states the team. The southern block is taller, more private, and built to inspire meditative thoughts. An open staircase that leads up to the upper floor of this section is visible at the central courtyard. 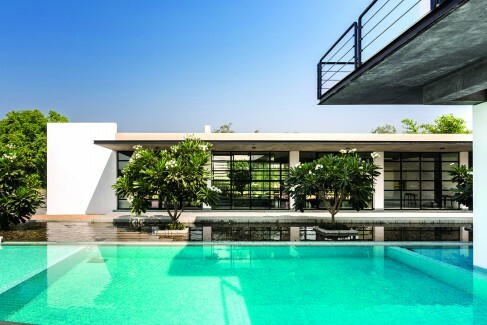 A luxurious pool runs by one side, with a water body surrounded by gravel and stone chips, and with frangipani trees standing in its path, runs along it and a bit beyond, giving the whole zone a sublimely reassured look. Unsurprisingly, in this section of winds, waters and greenery have been stationed in a semi-open deck, a meditation space, and hammocks. “The front party lawn space is left open with a few features like a gazebo, swings and the like.” adds the team. Everything here from the expansive chowk entrance onwards, with large walls decked in murals that remind one of old family homes, is inspired by the village look template. While a lot of the exterior employs literal references, the inside segments do it through their deep love for greenery and the need to constantly look outwards at them. The design team must be proud. 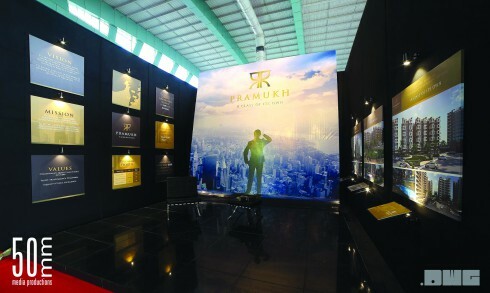 In 2015, the Pramukh Group, widely respected in Gujarat for their real estate prowess, were in need of a stall design for their first exhibition’s launch in two decades. “Their mission, vision and values had to be propagated through the design of the kiosk,” states the DWG team, which came up with a slick, simple and effective set-up that directed the spotlight firmly on the brand. On display were three on-going projects whose details were unmissable thanks to the black walls and flooring, aided well by warm focus lights. The stall was like a mini-gallery space, the projects’ plinths displayed on one side, and plaques defining the Pramukh brand’s signage, mission statements, and crucial statistics on the other. Visitors could sit in the middle, gaze and match notes, while a massive banner proclaiming the brand’s name with an arresting background image hovered over the entire space. It was a smart, shiny set-up this, with brand recall guaranteed. No wonder then that it won the award for the best stall design of the year.